Why drive the 2018 Honda Civic when the 2018 Nissan Sentra offers more for less? We've gathered all of the information on the 2018 Nissan Sentra's technology, comfort features, and safety! Prefer to experience it for yourself? Schedule your test drive and visit Flagstaff Nissan today! Get more for less, almost $2,000 less! 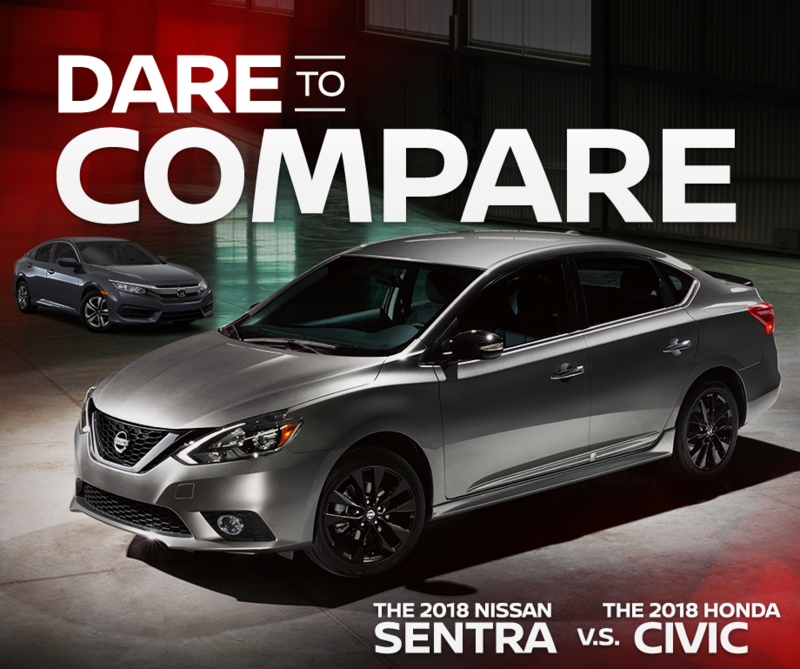 That's right - the 2018 Nissan Sentra starts at $1,850 less than the 2018 Honda Civic! But that doesn't mean you'll get less. The 2018 Nissan Sentra comes equipped with the features you really want in the compact sedan. We're talking key features that will make any road trip or errand run more fun. Standard features like a CD player, auxiliary port, MP3 decoder, trip computer and rear split bench - all features that are not standard in the 2018 Honda Civic. Plus, the 2018 Nissan Sentra comes with available BOSE® Audio, something that isn't even optional in the 2018 Honda Civic. Another feature you'll enjoy on your next road trip is more space! The 2018 Nissan Sentra may be a compact but with more front legroom and headroom than the 2018 Honda Civic, it certainly won't feel that way. Plus, get more out of your drive with NissanConnect standard & available tech features! The Sentra also offers Easy-Fill Tire Alert, an available safety feature that alerts you when your tires have reached the right pressure. This is another feature not offered in the 2018 Honda Civic. Don't settle for 2018 Honda Civic. Drive the compact sedan that delivers more for less today at Flagstaff Nissan. With the 2018 Nissan Sentra you'll get the tech features, space, and safety innovations for less! Fill out the form to schedule a test drive or visit Flagstaff Nissan today!